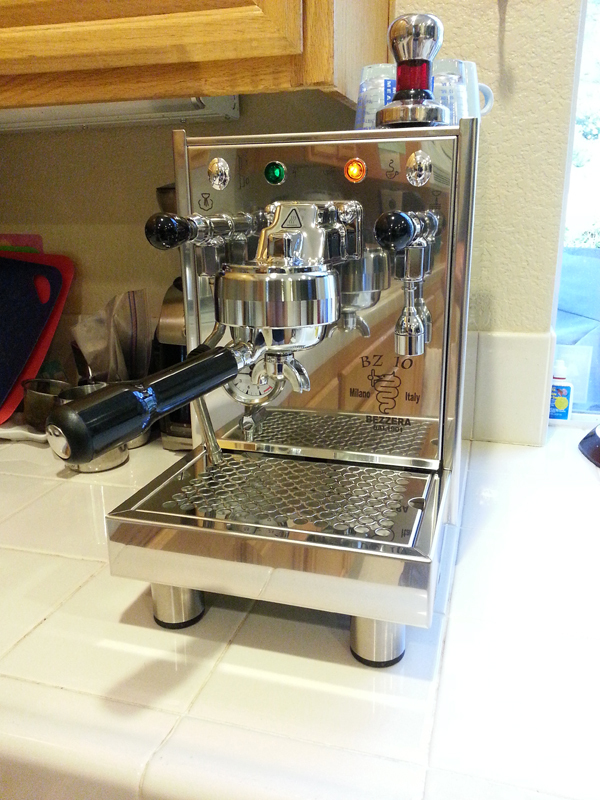 My home espresso journey just got a huge upgrade with the Bezzera BZ10. After quickly reaching the quality ceiling of my Delonghi EC155, I started looking for a machine that would not kill me financially, fit in my kitchen, and not leave me wanting more in just a few months time. 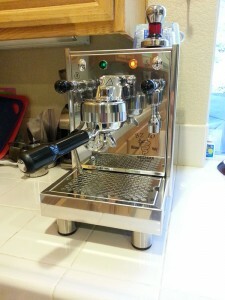 I looked at the usual suspects from Breville, Rancillio, and Rocket. But, when I really dug into the history of espresso, I found Bezzera. Made in Milan, Italy, and founded by the man who filed the first ever patent for an espresso machine, Luigi Bezzera, the company has been making machines for over 100 years. When I saw the Bezzera BZ10, I knew my search was over. Not only was is a beautiful machine (encased in shiny stainless steel), but it’s a surprisingly small, powerful, heat exchanger machine with pro grade parts. And, best of all, it heats up in only 10 minutes! This amazing start up time is partially due to a unique group head which has its own heating elements. So, it’s not an E61, but it acts like it. The stars further aligned when 4th of July sales were announced and the price came down to $1300. The machine comes with a 3 liter water capacity (1.5 liter boiler which is nickel plated copper with brass end caps), two spout commercial grade 58mm portafilter, single and double baskets, blind basket (for backflushing), cleaning brush, coffee scoop and a rather lame plastic tamper. I picked up a stainless steel tamper on Amazon for $18. The manometers on the machine show boiler pressure, and shot pressure. The boiler pressure is also your ready indicator. When it’s at 1 bar, you are ready to go. The brew pressure is super useful to tune your grind/tamp. The machine auto fills the boiler and will stop working if there’s not enough water, so there’s no worry of burning out the heating element. Brewing is a single push button on/off thing. But, the steam and hot water spigot have these cool joystick actuators. The steam side has a burst mode, where steam is on as long as you press, or push up, and the lever locks for infinite steam. There is definitely a learning curve when stepping up to a machine like this. But, given that I was using a modded naked portafilter for the Delonghi, I was pretty ready for this. I pulled a respectable shot on the 2nd try. The major mistake on the first try was not seating the portafilter all the way. The gasket is SUPER tight when the machine is new and it takes a major push to get the portafilter in at first. Steam power on this machine is great. Being a heat exchange machine, you can brew and steam at the same time, which makes you feel like a real barrista. Using a small 12oz pitcher (which I find perfect for making one latte or cappuccino), it steams the milk in about 20-30 sec. This is something I’m still getting used to. With the speed, I have less time to work the milk, so I need to work on technique quite a bit. But, what about the shot? It’s delicious. Playing with dose, tamp and timing, I’ve produced a range of flavors, all good, from the same beans. So, working on what I want to make consistently is going to be fun, and tasty. So, after just about a week, I have to say I’m totally thrilled with this machine.